After returning to Taipei from an overnight trip down to Taichung, we hurried back to our hotel in Taipei where we promptly dumped our bags and made our way to Formosa Regent Hotel where Aoki’s second dessert boutique in Taipei is located. Couldn’t help but felt extremely excited along the way and we weren’t disappointed. The boutique was lavishly designed, with a wide selection of petit gateaux, chocolates and macarons available. Literally spoilt for choices! But we knew we couldn’t possibly try everything all at once. Thankfully it was the first of several days in Taipei, sufficient for us to “ration” out our schedule to fit a little bit of Aoki everyday, not forgetting Joel Robuchon as well! Pure indulgence! We picked 3 cakes from the chilled display. Needless to say, first on the list has to be Bamboo, which I’d been dying to try for the longest time. Alas it didn’t work out well for me. Read here for my humble take on it. Then was Trio, a “limited edition” creation specially designed for the opening of the dessert boutique in Formosa Regent, Taipei. Since it is only available here and no where else, it makes perfect sense to try it! Its now or never! Then there is Valencia, which I’d attempted to re-create just a couple of months before our trip. Feeling extremely curious about how the real thing would be like, we had to try it as well! 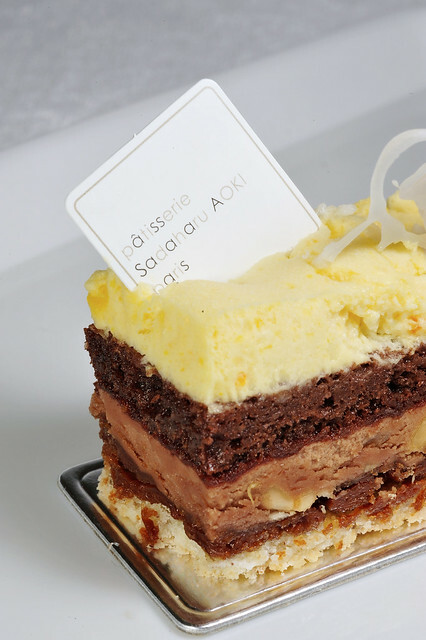 Valencia’s is a multi-layered entremet with 5 components, built slowly up from a dacquoise au noisette base, followed by layers of praline feuilletine, mousse au chocolat au lait, biscuit au chocolat et amandes, and finally a mousse au l’orange. I’m glad to say that Aoki’s version was really delicious. Every layer was distinct in texture and flavours but yet came together very well. Flavour profile was complex, always a welcoming feature for me for any entremet. Crunchy and slightly dense dacquoise and praline feuilletine layers at the bottom were well balanced by the light and creamy milk chocolate and orange mousse. 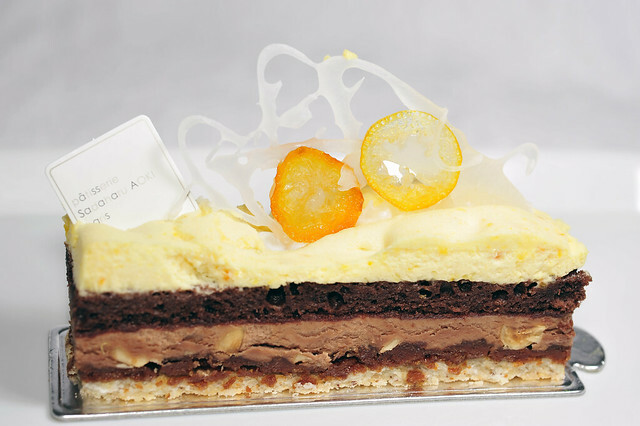 Chocolate lends a sense of richness and lavishness to the piece while the orange mousse on top provided contrast and maintaining a refreshing touch. 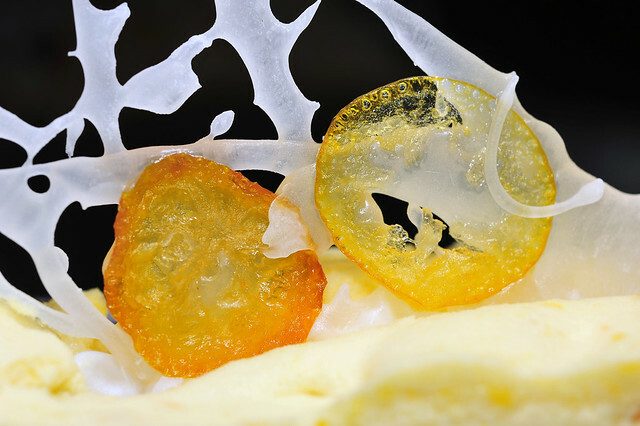 Aromatics were also well-played from the toasted hazelnuts embedded in the dacquoise as well as zesty orange mousse on top. Contrasting flavours which remained homogenised and harmonised made the sampling process highly pleasurable. And if the contrasting colour schemes of the cake body was not doing enough for you visually, the sugar and kumquat piece on top must surely be the jewel on the crown. 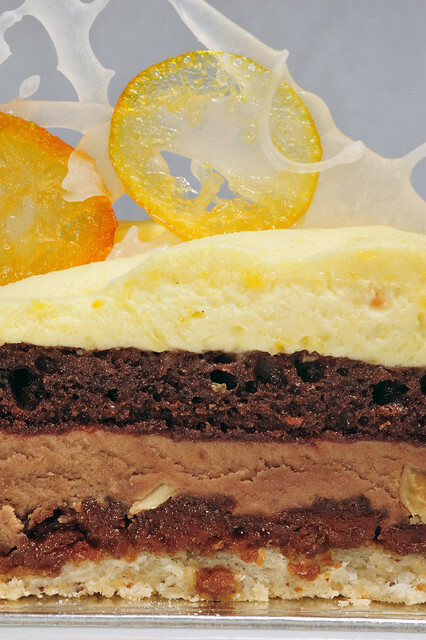 The marriage of orange and chocolate is a tried-and-tested matrimony in pastry making, often replicated in all sorts of desserts ftom cakes to truffles. While one who anticipates to discover new elements might find this combination much of a cliche, I personally found it rather reassuring and did manage to be pleasantly surprised, by the soft and fluffy textures of the orange mousse, which was incredibly ふわふわ “fuwa fuwa”, so unlike the gelatinous version made using the recipe published online. I’d have expected the milk chocolate mousse to be very sweet and naturally it was, but not exceedingly, as what one would experience in something like Pierre Herme’s Plaisir Sucre. For Valencia, all was within balance and control, and in this case by the delightfully aromatic and ever slightly sharp mousse au l’orange. So yes, I wouldn’t most gladly recommend anyone who is sampling Aoki’s work for the first time to try out Valencia バレンシア, which in my humble opinion, surpasses Bamboo in terms of flavours and textures. Otherwise, both are very vividly executed aesthetically, Valencia is quite a different animal compared to Bamboo. The latter speaks of Japanese elements and an almost zen-like transcendental beauty, reminiscent of our walk through the bamboo groves of Sagano in Kyoto, exuding an aura of calmness and serenity. Valencia on the other hand, is all about being dramatic, in all pomp and circumstance, summer and sunshine. This entry was posted on May 27, 2012 by Alan (travellingfoodies). 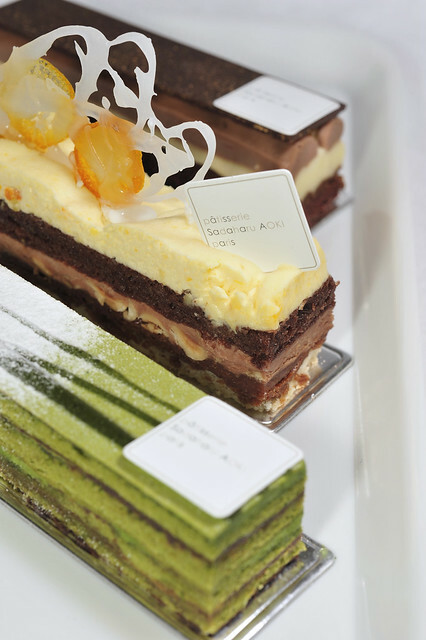 It was filed under Food, Travel and was tagged with バレンシア, entremet, 青木定治, formosa regent, patisserie sadaharu AOKI, petit gateau, sadaharu aoki, Taipei, Valencia. Alan, these look exquisite! Hopefully get to try them someday. Just finished sampling the Italian appetizers. There is no room for dessert. It is always wise to come with a full stomach.